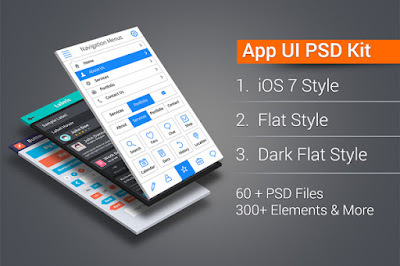 App UI Kit Is A Set Of Beautiful Design Elements Created In Photoshop. The UI Kit Features Flat, Dark Flat And IOS7 Design Styles. Using This Pack, You Can Create Beautiful IOS / Android Apps. The UI kit is carefully designed in Photoshop using shape layers that allow full flexibility to edit and modify the elements to fit your needs. All layers are well organized with each set of elements grouped on separate screens. Each screen comes as an individual PSD file. The kit contains over 300 elements in 60 PSD files along with bonus elements. The many elements include Top header, Navigation menus, Menu bars, Menu buttons, Search bars, Header banners, Widgets, Graphs & Pie Chart, Labels, Calendar & Tasks, Camera, Photo & Video Gallery, Tab boxes, Tool tips, Chat, Time Counter, Popup Alert, Form fields, Audio & Video, Music & Progress bars, Buttons, Pagination, Check Marks & Radio buttons, Star Ratings, Timeline & Footers, Map, Vertical Side Navigation, Bonus Icons, Backgrounds, Isometric Screen Display. The kit contains a large number of elements and icons and you can use the components to prototype your designs and save your time. Further, shape layers help you resize the elements easily for retina and non-retina layouts.